The plantar fascia is the band of tissue (ligament) that connects your heel bone to your toes. The main function of this Fascia is to support the arch of your foot. Any strain to the plantar fascia will make it weak, swollen, and irritated. This results in the bottom of your foot hurting when you stand or walk. Some of the causes of plantar fasciitis are: high arches or flat feet, prolonged walking, standing, or running for long periods of time, especially on hard surfaces. Plantar fasciitis can also be caused by shoes that don’t fit well, tight calf muscles or being overweight. Plantar fasciitis is also common with athletes. In order to decrease these symptoms, try to give the feet adequate rest by reducing the activities that cause your foot to hurt. Walking on hard surfaces should be avoided. Talk to your physiotherapist today. They can help you with various treatment approaches. To reduce pain and swelling, try putting ice on your heel especially when you first get up in the morning. Get a new pair of shoes. Pick shoes with good arch support and a cushioned sole. 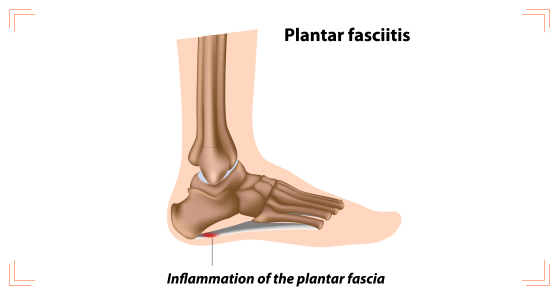 Plantar fasciitis most often occurs because of injuries that have happened over time. It may take time for the pain to go away completely. Stay with your treatment. There may be constant pain when you stand or walk. The sooner you start treatment,the better. Physiotherapy treatment will prevent the injury from being aggravated further. Here at PhysioNow we can help you to treat Plantar fasciitis with modalities like Laser, ultrasound and manual physiotherapy. Physiotherapy treatment would include stretches and strengthening exercises. We have a special tool called a “HAWK” that we love to use for Plantar fasciitis to strip out the scar tissue. It speeds up the healing of plantar fasciitis immensely. Custom orthotics may also be useful to support flat feet. Give us a call today to start feeling better! We can help!